As a little kid I used to look through the window of this huge guitarstore in my hometown and you could see hundreds of guitar hanging on the wall. One day I told my mother when I was gazing through the window again when I’m older and can afford it I want to have that guitar while I was pointing at a guitar which at that point I thought was a flying V.
Little did I know, the guitar was hanging behind another guitar and you could only see one side. Weeks went by and then my birthday came, my mother hadn’t forgot what I said and she bought this guitar for me. It wasn’t a flying V at all, although one side was flying V, the other side was “round”. I was lost, happy because I got the guitar of my dreams but sad because it turned out completely different as I expected. I couldn’t dissapoint my dear old mother as she bought it with her hard earned money, so bringing it back was out of the question. So I kept it and it has been with me all along. I had many guitars over the years but I always came back to this guitar because there simply was no other guitar which suited me better, played better or sounded better. Eventually I got used to the shape and fell in love with it. The guitar turned out to be an Ibanez Moderne (futura) copy of the 1957 Gibson Moderne which remains the Holy Grail of guitar collecting. Although being a copy of a guitar which might have never even existed the Ibanez is a world class guitar in his own right. It was made during a time Ibanez made their so called ‘lawsuit’ guitars which is used to describe any Japanese copy guitar made in the shape of an American manufacturer’s model. So here’s the lowdown. In Japan during the late 70’s and early 80’s there were several guitar makers that decided to copy/replicate the great old Gibsons and Fenders from the 50’s. They actually had vintage guitars, pretty much copied them very very closely and sold those guitars to high end guitar buyers in Japan. There were several makers and ALL of them made really good copies. 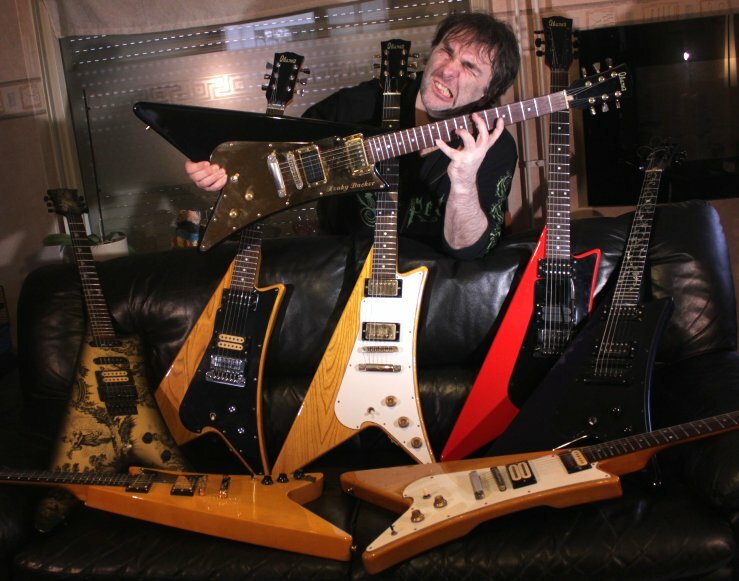 Ibanez,Tokai,Greco,Burny,Fernandes were the biggest and most well known. Not only are their guitars very accurate in feel, quality wood and construction methods were used. Good quality parts, tuners and pickups were used. If you put a Gibson logo or Fender logo on them you could fool many people except the experts in guitar identification.? The goal was to reproduce the best American made guitars from the golden era, the late 50’s and make them affordable to the high end Japanese markets. They are some of the best guitars ever built from playability to attention to detail to tone, at a time when the Amercian guitar makers were making a poor quality product. The Ibanez Moderne is no exception there IS a tonal difference that many people like better, more sustain and resonance. A famous guitar player who used such a lawsuit guitar was Eddie Van Halen. He used an Ibanez Destroyer on the Van Halen 1 album and we all know the guitar sound of the first Van Halen album is one of the best there is. Through the years I collected more of these and customized them and they all sound amazing. I WAS ONE OF THE LUCKYPLAYERS BACK IN THE 70S TO PICK UP A FUTURA AS IT IS CALLED BY IBANEZ A 1976 COPY OF THE GIBSON MODERNE, AFTER GETTING ALOT OF PLAY FROM 76 TO 81 I RETIRED FROM THE MUSIC BISS AND IN 2005 GOT BACK INTO IT, THE GUITAR HAS A FEW BATTLE SCARS FROM ROAD USE HOWEVER ITS IN PRETTY DAMN GOOD SHAPE CONSIDERING IT SAT IN A CLOSET FOR 24 YEARS UNTOUCHED, I AM ATTEMPTING TO RESTORE IT BECAUSE I HAVE SO MANY CLASSIC VINTAGE GUITARS FROM MY FIRST MUSICAL ADVENTURE ITS WORTH THE EFFORT, IT SOUNDS SOMETHING BETWEEN A FLYING V AND A LES PAUL CLOSER TO THE V BUT IT PLAYS AND LOOKS GREAT, ITS A KEEPER AND A RARE LAWSUIT MODEL 76 BICENTENIAL YEAR, ALONG WITH MY GIBSON FIREBIRDS FROM 76 ITS A COOL PLAYER. Hi Henky, thanks for the pick guard pictures. My Futura should be finished by the end of May, will send pictures. Would you be willing to sell one of your Ibanez Moderne’s? Hi Henky nice guitars ,i have owned 2 ibanez modernes in my life ,one got stolen from my house ,and one i sold on ebay like over 10 years ago .i would like to talk to you about ibanez modernes ,is there an email i could use to contact you ? thanks . Heb ergens nog een cassette liggen volgens mij met een solo van je tijdens “de strijd om de gouden oordopjes”..was dat niet bij Hanneke Kappen destijds? WOW! love your collection! Yes it is my #1 guitar also! I bought mine back in 1981 from “we buy guitars” in new york city across the street from manny’s. the case was mixed up with a dean v case and my headstock has the guild type, so it is post lawsuit however no serial number on headstock but a “Z18” inpressed on the fretboard below the 22th fret, tuners were changed, guitar stap post behind neck joint was moved and even though it is not totally original, it sounds great acoustically and amplified. until the internet i did not know about the history of these and their asian counterpart releases and found by accident a video by eddie money callled “shakin” . Een vriend van mij wil de zijne gaan verkopen. Wat is de waarde van een near mint kwaliteit zonder serienummer met gibson headstock? You have an amazing collection. Please check your private messages on Ibanez Collectors World.